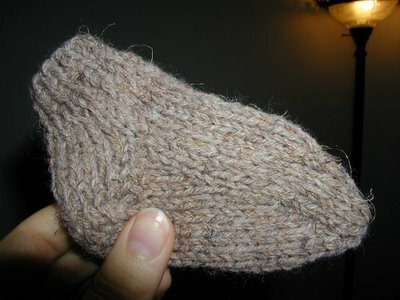 I finished the Practice Sock from Knitty last night. I used some more of my wool-ease that just never seems to go away (not that I'm complaining). I am so glad I did this. One: it got me familiar with the basic sock construction and terms like "instep" and "heel" as they relate to knitting. Two: I plan on magic looping socks with one circular needle (because DPNS are the DEVIL). It was a little awkward working with one circular and some of the heel stitches are a little wonky, but, eh, it'll improve with more practice. So now I think I'm ready for the real thing. Sometime today or this weekend I'm going on a yarn binge, because Joann's is having a sale on all Lion Brand yarns including wool-ease and Homespun. I'm planning on using Homespun as a substitute for the Ballet Wrap featured on the cover of Interweave Knits. I don't have the pattern yet, so I'm not sure if I should get the yarn, but it is on sale. Oh, the dilemma. Anyway here's the practice sock for you macro viewing pleasure. EXTREME CLOSEUP! My mom has also put in request for a hooded scarf. And I'm thinking of adjusting the Irish Hiking Scarf that I adore to a Hooded Irish Hiking Scarf. I'm planning on using, yup, wool-ease for this one. Machine washable, warm, and afordable. Can't beat it! Well, my fiber friends, I'm planning on bringing in the New Year with Mr.V, knitting, movie-watching, book-reading, and Andes manhunting. I'm still wondering if I'll do the New Year's Resolution thing. How about you? Do you have a New Year's Resolution? Resolution? Eh, probably not. 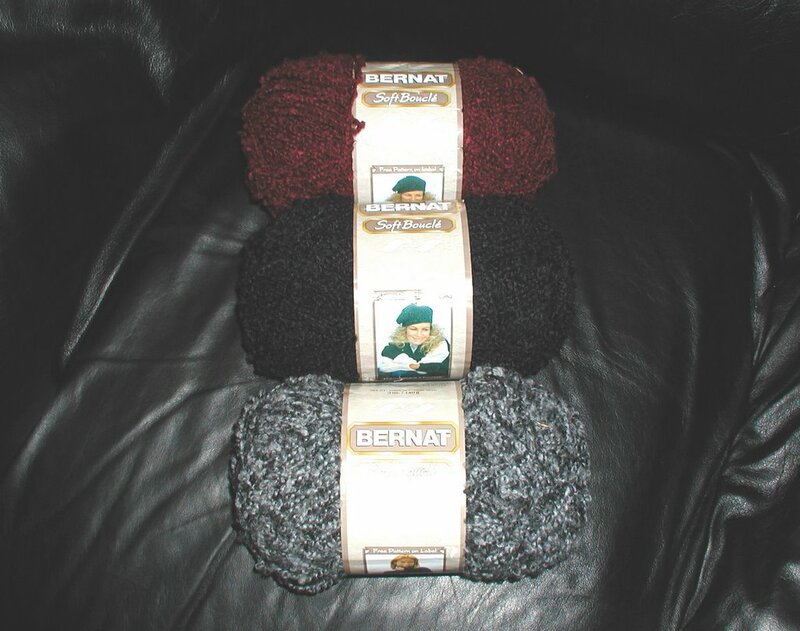 I'm going to a party tonight, should be fun, there will be other knitters there :). With the boucle...is there enough to make like a sleeveless top? Or you could make a minisweater maybe. New Year's resolution? Hmmm...... Yes, I think I'll knit more and take up spinning! Now that's a resolution I know I can keep. Still no Andes huh? Shameful Mr. V! Love the sock, it's so cute and it looks like a great way to learn how to knit socks without spending all the time making big ones. Cool stuff! To kick off the new knitting year, I've started a blog ring for knitters in upstate NY. I'd love to have your blog in the ring. To join, go to my blog at www.susanhealykribs.typepad.com and click the join link under Upstate New York Knitters.